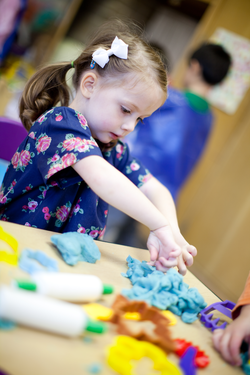 Free Play/Choice Time This includes an art activity and choices throughout the learning centers in the class room with optional activities that frequently emphasize the week's theme. All children participate in Clean Up Time. Circle/Group Time This includes songs, stories, math, science, movement, and other activities relating to the theme of the week. The frequency and length of group times are adapted to the age and developmental level of the children in the classroom. On Fridays we observe Shabbat. Snack Time The children are encouraged to set up and clean up their snacks. The snack will be posted daily. Gross Motor Play We go outdoors daily if weather permits. If not, we play in one of our indoor gross motor areas. Preparing for Departure Coats on, final stories and songs, and farewells.